Tuesdays - 6 p.m. to 9 p.m.
Saturdays - 9 a.m. to 3 p.m.
Tuesdays - 3 p.m. - 6 p.m. Please ensure you have your disposal site permit when visiting the site. View our calendar for upcoming events and activities in O'Connor Township. All meetings are held in the Council Chambers in the Municipal Office located at 330 Hwy. 595. Council welcome your involvement and interest in Council meetings. Monday, Tuesday, Wednesday, Thursday - 9:00 a.m. to Noon, 1:00 p.m. to 5:00 p.m. PLEASE NOTE: The Township office will be closed both Friday, April 19th for Good Friday and Monday, April 22nd for Easter Monday. A Budget Meeting will be held on Tuesday, April 23rd at 6:00 p.m. followed by regular Council meeting at 8:00 p.m. The purpose of this meeting is to discuss the 2019 Fire Department and Roads Department budgets. This meeting will take place in Council Chambers located at 330 Highway 595. A Full Budget Meeting will be held on Monday, June 3rd at 7:00 p.m. This meeting will take place in Council Chambers located at 330 Highway 595. Regular meetings of Council shall be held on the second Monday of each month at 7:00 p.m., except for the month of December, when the meeting will be held on the first Monday of the month. A meeting of Council shall be held on the fourth Monday of each month at 7:00 p.m. except during the months of July, August and December. Only during the month of December, a meeting will be held on the third Monday. Where any of the meeting dates fall on a statutory holiday the meeting will be held on the Tuesday of that week at 7 p.m.
As of Monday, April 1st, Fire Permits are required prior to ALL outdoor burning during the fire season running from April 1st until October 31st as per the Forest Fire Prevention Act. Small fires for cooking or warmth do not require a fire permit. Fire and Incinerator Permits can be picked up at the Township Office during regular office hours at 330 Highway 595 or from Fire Chief Henry Mattas at 741 Barrie Drive (please call ahead at 473-9511). Truckers are requested to take notice that load restrictions will apply on all municipal roads within the Municipality of O’Connor, effective Monday, April 1st, 2019 at 12:01 a.m. and will continue during the period designated by the Municipality of O’Connor. January 30, 2019, the Township of O'Connor's new Official Plan was approved by the Minister of Municipal Affairs and Housing, with some modifications and has come into effect as of January 31, 2019. A Office Consolidated copy will be made available in the near future, on-line, as well as hard copy from the office, if requested. The Township of O'Connor Zoning By-law will now be updated to incorporate the new Official Plan. A Public Meeting will be held in the near future for review of the proposed Zoning By-law. Watch the May issue of the Cornerstone and this website for the date. A draft copy of the document will also be available in the near future. The O'Connor Community Club will be meeting Monday, May 6th to put baskets together for the 2-Bit Auction at 7:00 p.m. in the O'Connor Community Centre at 330 Highway 595. Proceeds from this fundraiser held Saturday, May 25th will be put towards the purchase of playground equipment in the Community Centre yard. See link below for complete details. The next regular meeting will be held Tuesday, June 4th at 7:00 p.m. at 330 Highway 595 in Council Chambers. Thank you for your support. The following fundraising events have been scheduled. Should you wish to make donations for either event, volunteer your time please call Lorna or Linda at 476-1451. The Community Club is still in need of donations for this event. Please call Lorna or Linda at 476-1451 for more information or to reserve a seat to play. Council for the next four years has been set. Congratulations to our new Council. Mayor Jim Vezina (middle), Councillors (from left to right) Jerry Loan, Wendy Handy, Alex Crane and Bishop Racicot. Thank you to everyone who came out and voted and to Jonathon Hari for also putting his name forward. Thank you also to Kevin Foekens, the outgoing Councillor, for 4 years of dedication and service to the Township of O'Connor as a Council member. For School Board results please go to www.elections.ontarioschooltrustees.org or go to the City of Thunder Bay website. In accordance with the Municipal Elections Act, the Clerk as Returning Officer conducts elections for the offices of one Mayor and four Councillors. The term of the new office commenced Monday, December 3, 2018 and serves for four years. 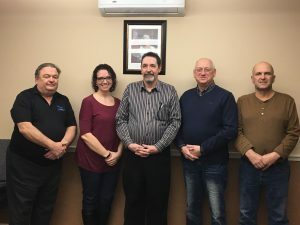 The Township of O’Connor was fortunate this year to receive funding from the Clean Water Wastewater Fund (CWWF), through both the Federal and Provincial governments, to replace several road culverts throughout the Township. This fund covers 50% of the total cost of the project. 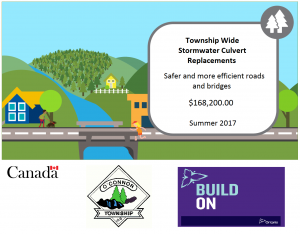 To cover the Township’s share of the project we will also be using funds from the Federal Gas Tax Fund (FGT) and the Ontario Community Infrastructure Fund (OCIF) to change approximately 60 culverts in our road system. March 1, 2017 - Ontario is celebrating its 150th anniversary as a province by improving and renovating over 200 sports facilities, parks, seniors centres, and other community spaces, bringing positive changes to communities and families across the province. The Township of O’Connor would like to announce that our application to the Ontario Trillium Foundation ( OTF ) Ontario 150 Community Capital Program grant has been approved and we will be receiving $34,500.00 to upgrade the HVAC system and make other interior upgrades to the O’ Connor Community Centre. This will include air conditioning in the centre. Thank you to the Ontario Trillium Foundation for this opportunity. Update July 10, 2017 - A public announcement of this funding was made at the O'Connor Community Club's annual Strawberry Festival held on July 8, 2017 in the O'Connor Community Centre. A banner and plaque, also announcing this funding, are being displayed in the Centre as well. Update September 30, 2017 - The Township would like to announce that the Ontario 150 Community Capital Program Grant renovations are complete. The O'Connor Community Centre now has new energy efficient propane furnaces and air conditioning, new washroom partitions have been installed in the basement washrooms and the storage room has been repainted and new shelving installed, along with better air circulation. Thank you to the Ontario 150 Community Capital Program Grant once again for this opportunity to continue to approve our O'Connor Community Centre and make it a more inviting public space to come to for all social events, both public or private in our community. The Ministry of Health and Long-Term Care has developed communications material to promote awareness of the change to income thresholds under Seniors Co-Pay Program (SCP) and encourage eligible seniors to apply. Senior couple - a combined income of less than or equal to $32,000. Pay no annual deductible and a co-payment of up to $2 for each prescription. April 9, 2018 - Special Meeting held for the draft Official Plan and Zoning By-law. This meeting was open for the public to make comment on the draft Official Plan and Zoning By-law. This meeting was the last opportunity for the public to participate and provide input on the draft Official Plan which was adopted April 23, 2018. The draft Official Plan will be submitted to the Ministry of Municipal Affairs (MMA) for approval. Once the draft Official Plan has been approved by the MMA, reviews will commence for the Zoning By-Law. Copies of the draft Official Plan are available for pick up at the Township of O'Connor Municipal Office during regular office hours or can be found on this website. Please watch our website for further updates. March 13, 2017 - Ministry comments have arrived on the draft Official Plan and are currently being considered by Council. The review began at the March 13, 2017 Council meeting and will continue at the March 27, 2017 meeting. November 9, 2016- The draft Official Plan for the Township of O'Connor was submitted to the Ministry of Municipal Affairs for a One-Window Review. The Township of O’Connor invites you to become engaged in planning for the Township’s future. On June 25, 2016 the Township hosted an Public Open House to present, review and receive input on changes to the Township’s Draft Official Plan and Zoning By-law. The Official Plan provides the overall policy direction for development in the municipality, and the Zoning By-law implements the policies through regulations. These documents apply to the entire municipality. The Open House was the first public consultation event of the review process, however there will be additional opportunities for input at later stages of the process. If you wish to be notified of the adoption of the proposed official plan, or of the refusal of a request to amend the official plan, you must make a written request to the Township of O’Connor. If a person or public body does not make oral submissions at a public meeting or make submissions to the Township of O’Connor before the proposed Official Plan is adopted, the person or public body is not entitled to appeal the decision of the Township of O’Connor to the Ontario Municipal Board. If a person or public body does not make oral submissions at a public meeting or make written submissions to the Township of O’Connor before the proposed official plan is adopted, the person or public body may not be added as a party to the hearing of an appeal before the Ontario Municipal Board unless, in the opinion of the Board, there are reasonable grounds to add the person or public body as a party. For more information on the Township Official Plan and Zoning By-law review process, please contact Lorna Buob, Clerk-Treasurer at twpoconn@tbaytel.net or 807-476-1451. Please note: The New Hours for the Thursday Clinics at the O'Connor Community Centre - 10:30 a.m. to 4:30 p.m. The clinics are every second Thursday at the O'Connor Community Centre - 330 Highway 595. They are also here on the third Wednesday of the month by appointment only. See events calendar for dates. For more information or to make an appointment please call 626-8474. A video produced by the Canadian Institute for Health Innovation and funded by the Ontario Government was filmed in the Township of O'Connor and surrounding area. This video details the need for their mobile service and the services they do provide. To view this video please click on this link. Password is "thunderbay". Service Ontario has launched a new section for not-for-profits in Ontario making it faster and easier for organizations to get the services and information they need to start, operate and grow their NFPs. The new site features information on government open call programs for funding, ideas on how to start and manage a not-for-profit organization, a section to help organizations understand the laws that affect the sector, research about the sector, government initiatives that support the sector, and much more. The O'Connor Community Centre is available for rentals with the basement kitchen and main level renovations, including a new accessible platform lift. With reasonable rental rates the Community Centre is waiting for you. To book your event please call the Township of O'Connor office at 476-1451. If you would like to rent the Community Centre for an event and someone attending may need to use the platform lift you or someone you appoint must be trained on its operation.